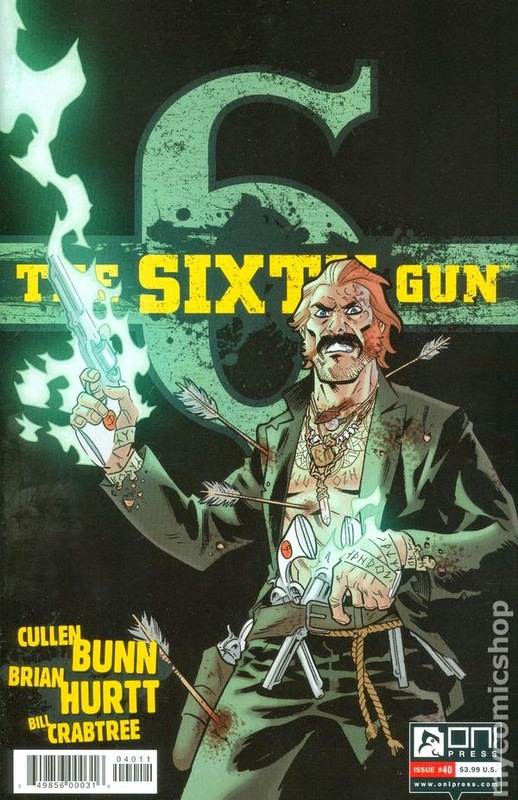 The Sixth Gun #40 - Written by Cullen Bunn, illustrated by Brian Hurtt, colored by Bill Crabtree, lettered by Crank!, designed by Keith Wood, edited by Charlie Chu, published by Oni Press. Am I correct in saying that the ever-amazing The Sixth Gun is wrapping up with issue #50? I believe I read that somewhere ages ago, but given the current momentum of the story and the events of this issue, it looks like 50 is correct. This is sad, denizens, as Bunn and Hurtt’s tremendous supernatural Western is something I look forward to spending some time with every month(ish). Just like meeting the person of your dreams right before you ship off for that once-in-a-lifetime candy-taster job at Willy Wonka, let’s not think about the looming despair-ridden day it all ends, but instead enjoy the good times to be had. Things aren’t looking good for Drake, Becky, and Nidawi. Asher, Gord, and Nahuel are dead, Kirby was taken, and now Jesup and his entourage of serpent men mean to put what’s left of our heroes six feet under as well. To make matters worse, Nidawi is bleeding to death, but the severed—yet living—shrunken head of Screaming Crow (how often do you get to write a sentence like that?) has a plan to save the woman. As the battle of the Six commences, and Jesup gains control of another gun, Becky has an insane plan. I read this book in record time. As much as I wished to savor every panel of Hurtt’s lovely art, the story demanded I whip through as each oh no, I can’t believe they did that, and what’s gonna happen next?! moment compelled me on. 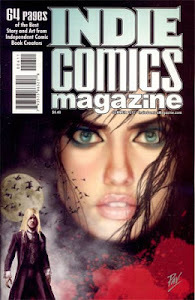 This issue kept the action going, all while moving the story forward with Screaming Crow taking charge, and with Becky using the power of her gun to travel back in time to consult with a dead character. The fight between Drake and Jesup has been building for a while and when it finally happens, Drake loses one of the six guns, bringing the end of the world that much closer. Then comes Becky’s decision that initially made me question the creators’ decision, but when I thought about what happened (sorry not gonna spoil today) it all made sense. By the end, I was all smiles—although I was a smiling nervous wreck. For the first two trades worth of the series, my one gripe was I wanted to see Becky take the initiative and to start making decisions. This has not been a problem for quite some time now, as she clearly has grown, knows what she wants, and no longer has a problem doing what she feels is best. Drake continues to be a mystery, and I still hope to someday see a bit more of Drake’s past revealed before the three remaining guns in his possession alter him forever. The characterization and dialogue are solid, with each character clearly having their own voice. Hurtt’s artwork is as beautiful as ever, and whether he is depicting tense action, drama, or rich character designs his storytelling is always flawless. Crabtree’s colors always push the emotions of Hurtt’s imagery, but the green-glowing Jesup and the time-traveling Becky standout brilliantly in this issue. I am thankful that The Sixth Gun came in on time this week—the shipments to my LCS containing “S” titles get delayed often <pffft>—but that just means the wait for #41 is going to be all the more brutal, denizens. Ugh. I love this series and I am going to be very sad when it comes to an end; at least we still have about a year to go. Not only that, we also can look forward to another prequel, this one titled The Sixth Gun: Days of the Dead, which covers Jesup and Brother Roberto. The Sixth Gun is gem of a comic every comic book fan should be reading. VERY HIGHLY RECOMMENDED! Alec Holland, the Swamp Thing, has been duped into the body of a human, a human that is rapidly burning out, and when it does, so will pass Alec. His avatar body has been taken by a corporation bent on using it for the diabolical means of profit masquerading as an effort to benefit mankind. Unfortunately for Alec, he has no idea who has his body, what they are doing with it, or where it is located. Not only that, the beautiful woman known as Miki has revealed that she is an avatar of the Mycos, or rather of fungi, the Grey, and Miki has been burning through human bodies for centuries when she abandoned her avatar form, which is being kept at the temple of the Sureen. If Alec is to save his life, without taking anyone else’s, then he will have to think quickly and not reveal the revulsion he feels at the trail of dead Miki has left in her wake. As much as I loved this issue, there is one thing that makes me nervous, and that one thing appears on the final splash page: Aquaman. Now, nothing against Aquaman—I have not been reading his book, but have heard it is good—but as I have said from the beginning of this relaunch, I wish this book was still under Vertigo. There, I said it again. The guest-appearance/crossover into other titles is something I almost always find off-putting, and I can’t help but wonder how much more successful the whole “Rot World” storyline would have been had there been no other super heroes gumming up the works. I also see the guest-appearance/crossover as something of a portent of doom for the titles I enjoy—remember how great I, Vampire was before Batman showed up? Now we have Aquaman appearing, and we are directed to another title to get the whole story. I could be jumping the gun here, maybe the story will be awesome; we’ll just have to see. Again, I wish Swamp Thing was still under the protective embrace of Vertigo, but despite the groan-inducing interruption of a guest-appearance/crossover/event this issue comes VERY HIGHLY RECOMMENDED! Leward has been saved from the rampaging mers! Or rather, she’s been captured by “Outliers,” pirates who roam the seas despite the mers, and who are rumored to be cannibals and consorts of the creatures. Not only that, Captain Mary of the Argo 3, a vessel shaped like a gigantic mer, has a pet pink mer that he unleashes on her. When she comes to from the creatures’s venom, Leeward discovers her intel on the Outliers might not be all that accurate. Unfortunately for all, Governess Vivienne of the Arm—an authoritative police force—are after Leeward and all who have spoken with the girl, and they now know where to find her. 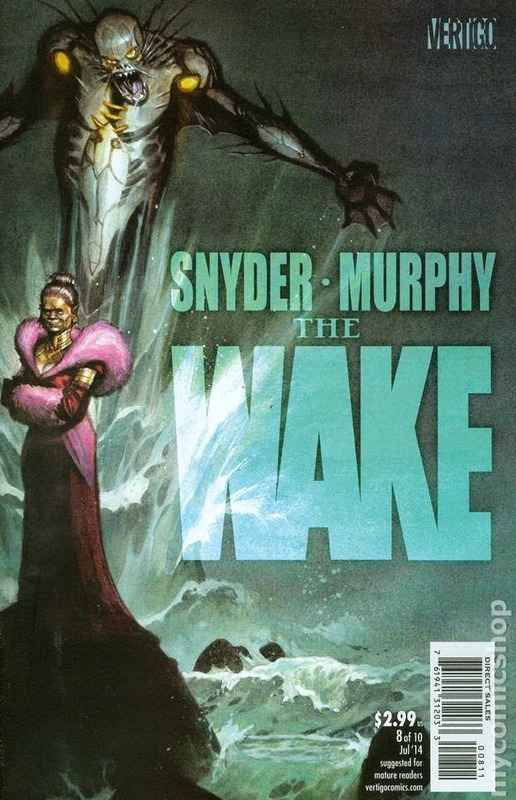 Snyder and Murphy deliver yet another outstanding issue of The Wake, and in its wake (see what I did there?) they bring a whole host of new questions and curiosities. I instantly fell in love with the character of Captain Mary, Walleye (the pink, toothless mer), the bizarre Argo 3, Gabby the robotic parrot, and their briefly-seen home. There is so much happening in this issue, and there is a hint of a bigger purpose to the mers regarding their lack of attention to those who explore the lands beneath the waves as opposed to exploiting them. To be fair, I have to admit to being confused on a few pages as to what was actually happening within the dialog, but that’s okay. My slight confusion aside, I am torn between my desire to reach the end of this fantastic story and wanting to stay in this fascinating world for years to come. 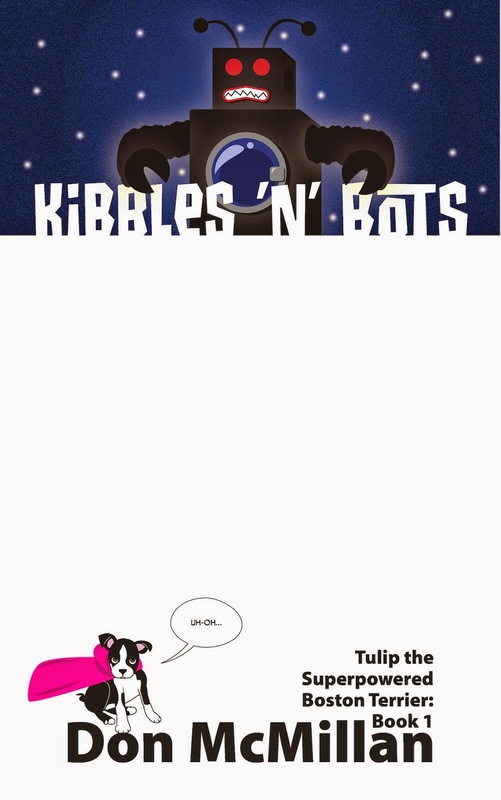 Everyone should be reading this comic. HIGHLY RECOMMENDED! Rex, Zombie Killer #4 - Written by Rob Anderson, illustrated by Dafu Yu, colored by Juan Romera, lettered and designed by E.T. Dollman, edited by Paul Allor, published by Big Dog Ink. Not just dogs and cats living together, but apes, monkeys, and squirrels as well. Throw into that mix a world filled with innumerable “rotters” and the few remaining humans as lead by one power-mad military man, and you have the bones of the excellent Rex, Zombie Killer. Rex and his crew have made the perilous journey to Las Vegas where they band of animals were promised to find a “safe place,” which they find. Unfortunately, the “safe place” is not quite move-in-ready. Rex failed to mention that his human and the “safe place” are under the military control of the cruel Major. Thankfully, Rex has a plan to seize control of the military base, but the plan has a lot of moving parts and the looming zombie menace adds a degree of unpredictability that can ruin everything. 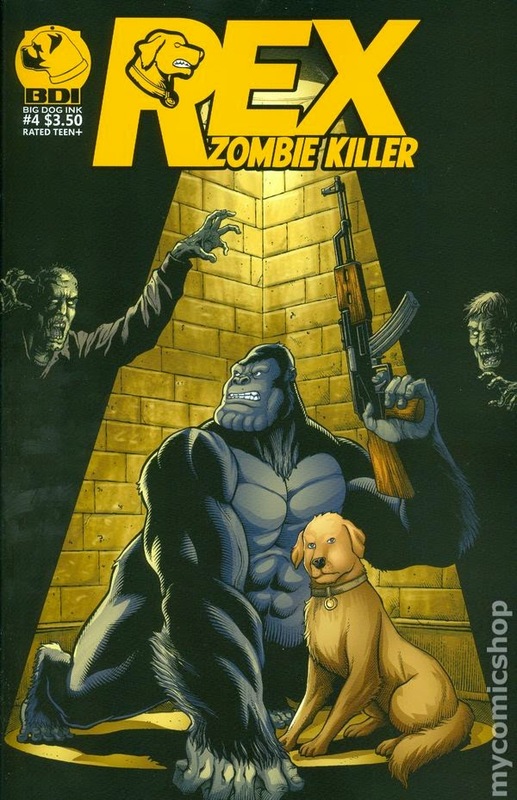 It’s The Incredible Journey meets The Walking Dead as our fine-furry friends risk it all for safety in a most unsafe world in this exciting conclusion to Rex, Zombie Killer. Yu’s artwork somehow manages to look even better than each stellar issue as he conveys all of the key dramatic moments through the animals’ expressions, and his storytelling glides the eye from panel to panel, page to page. The double-page spread in this issue is something you just have to see, and Romera’s beautiful coloring and rendering make those pages even more stunning. As for the ending, the story wraps up wonderfully with all of the major questions answered, but I will say I wasn’t ready to leave the creators’ world quite yet…but whatchagonnado. I’m not sure if Anderson and Yu will someday return to Rex, Zombie Killer or not—I should ask them—but there is room to see what happens now that the animals have achieved their “safe place.” I’m also curious as to how the zombie-killer crew deals with their losses and the fact that Rex was not completely honest with them throughout the mini-series; time will tell if we get more Rex in the future. 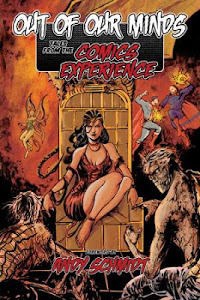 For now, you can find the one-shot on Comixology, and the entire limited series at mycomicshop.com or at the Big Dog Ink website. As a final thought, I have to go on record and say I still disagree with the creators about their views on squirrels, and view the idea of those animals organizing as a portent of doom, but despite that notion, both this issue and the series as a whole come HIGHLY RECOMMENDED! Italian TV actress Maria Melato gets a glimpse back to her rough past in war-torn Italy, and it is no wonder she beat the holy hell out of the man who still has not fulfilled his promise to marry her. Michael (the new star of Satellite Sam after his father was found dead in a secret apartment with loads of girly Polaroids) watches some of his father’s old film reels, but when he stumbles upon a particular reel that is NOT fit for broadcast, he begins to see how his father’s debaucherous proclivities might have gone too far. Finally, a Tijuana bible upsets Satellite Sam co-star Clint Haygood and Christmas parties are rarely any fun. 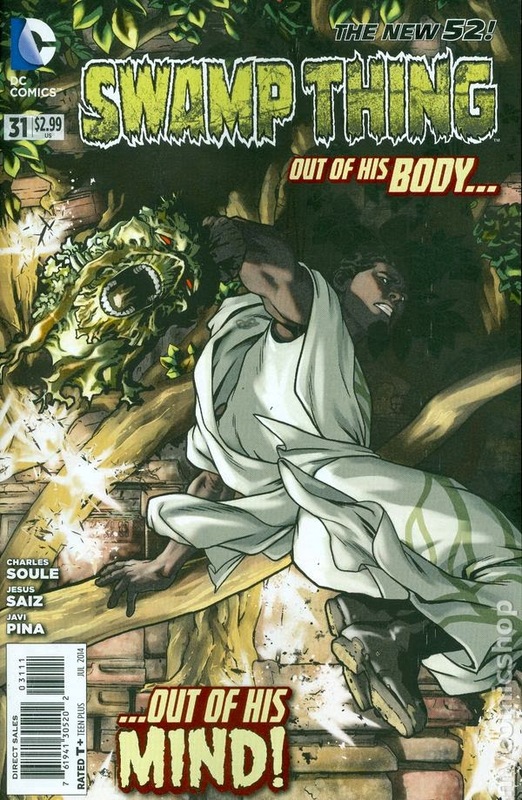 As I’ve said before, I love reading Satellite Sam in issues, but reading in larger chunks might be the way to go in order to keep up with the large cast of characters involved in this tiny television studio; you can get the first five issues in this trade that retails for $9.99. Fraction’s dialogue on this compelling crime drama is impeccably written, and Chaykin’s art work, whether delivering the drama or showcasing the incredibly stylishly-dressed cast, is something that must be seen. This is not a book you read when you are tired or distracted. No. You need to pour yourself a rye on the rocks, or if you don’t drink, a coffee black as the devil’s soul, put on some mellow jazz music, retreat to the lounge room, and immerse yourself in this brilliant comic. If you are a fan of Mad Men, then this one is a no-brainer. HIGHLY RECOMMENDED! Still No Undertow #3 For this Donist - Oh well. I’ll be happy if it shows up next week, as I think Batman is the only book set to appear in my pull. We’ll see.